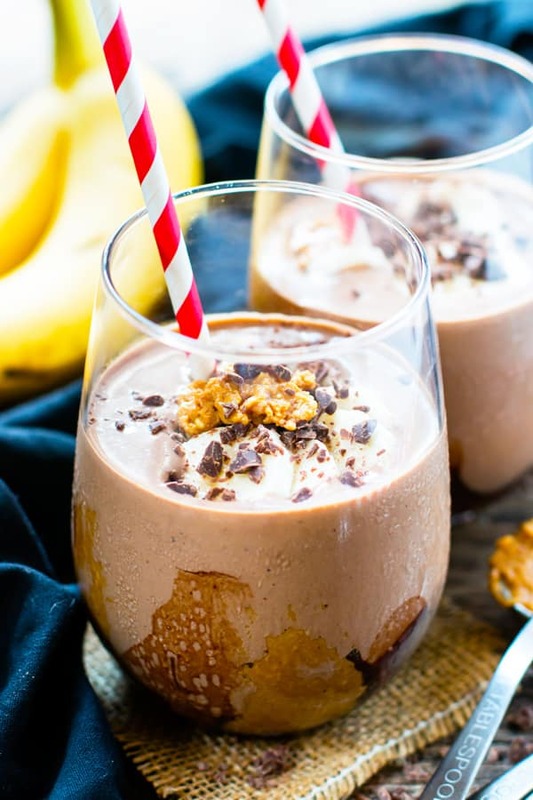 This Protein-Packed Chocolate Peanut Butter Smoothie is full of bananas, yogurt, and your favorite protein powder for a healthy and filling gluten-free breakfast smoothie recipe. Peanut butter and chocolate are the ultimate food match made in heaven. One would not be complete without the other. 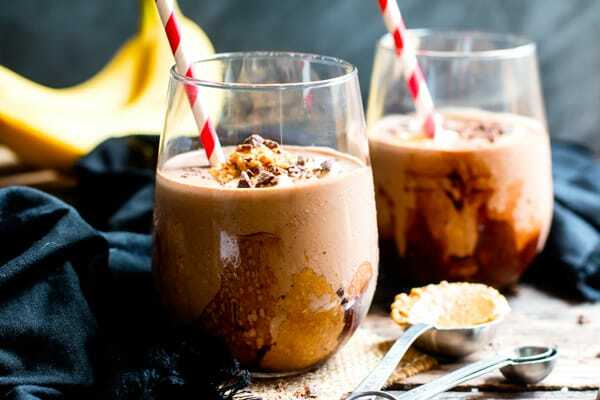 Especially in this protein-packed chocolate peanut butter smoothie. The creaminess of the peanut butter combines with the richness of cocoa powder. I promise you, you WILL want to get out of bed for this one in the morning!! A week and a half ago we were running around like chickens with our heads cut off. Sorry for the visual, but I swear that’s what we felt like! 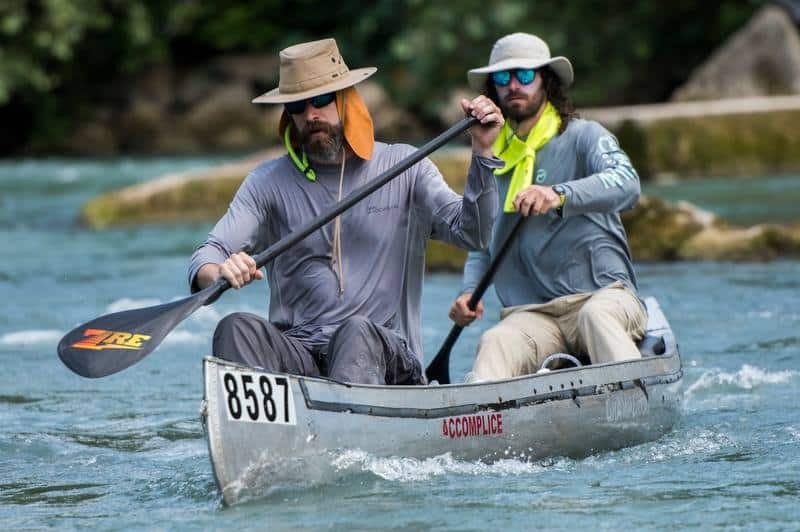 We had the grand idea to put our house on the market the exact same weekend my husband would be competing in a 260-mile canoe race that spanned the course of 3-4 days. Our dog, Tevah, is part Husky and sheds like crazy. It is impossible to clean up after her on a consistent basis. So we thought a weekend with us out of the house would be the perfect time to let strangers come peruse our pad. What I had not quite anticipated was the fact that I would need to be experimenting with recipes during this time, also. As one of the team captains to Team Brozillians, I was in charge of creating and making a ton of food that would help nourish Cohl and his brother, Jhet, throughout their 60+ hour journey. Suffice it to say, there was a lot of making a mess in the kitchen and then frantically cleaning up before the house went on the market! 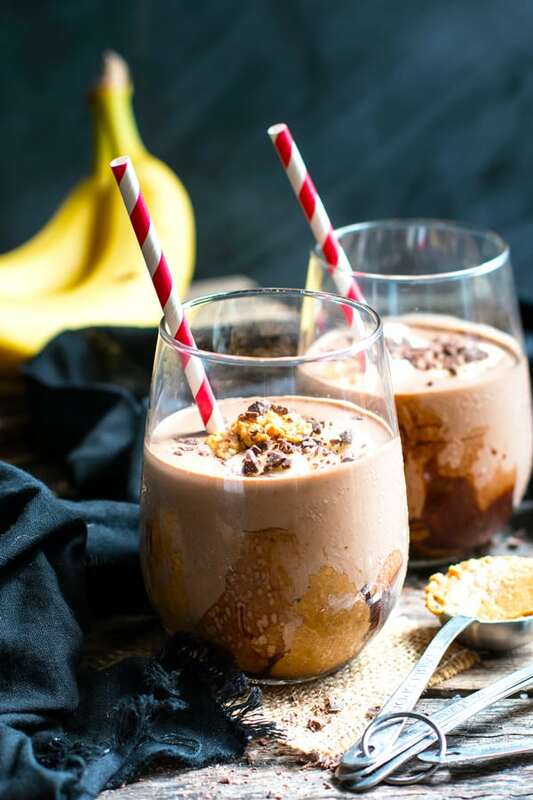 Before the race, I talked with Cohl and he let me know that he would need a lot of protein, easy-to-digest carbs, and foods that would be easy to put down… Like this Protein-Packed Peanut Butter Chocolate Smoothie. The week before the race I made these chocolate peanut butter smoothies with our favorite chocolate protein powder. –> The BEST protein powder we have found is the Garden of Life Vanilla and Garden of Life Chocolate-Flavored Protein Powders! It is made of vegetable proteins, is super easy to digest, and is 100% vegan and gluten-free! Cohl loved this chocolate peanut butter smoothie!! Throughout the race we had a generator going that would help us power up the NutriBullet we brought along. We made different variations of this smoothie, including one with cold-brew coffee and no cocoa powder, that the boys kept requesting throughout the race. 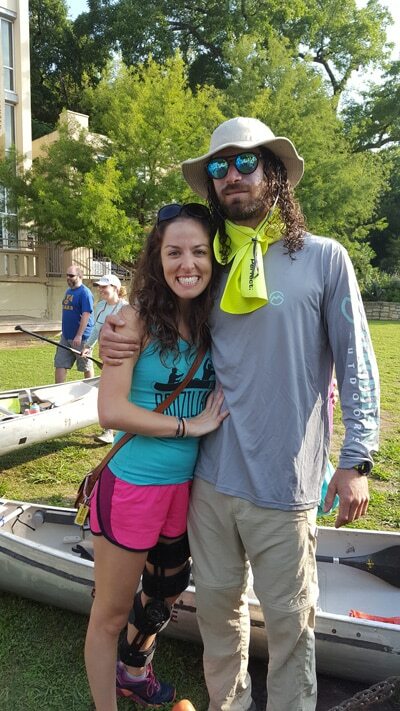 Here are a few pictures from our sleep-deprived, family-fun-filled Texas Water Safari weekend. 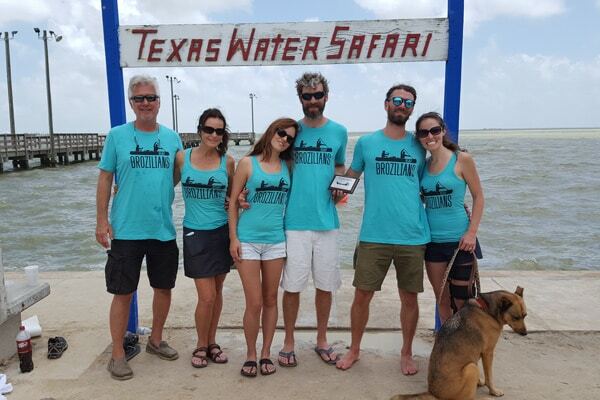 We are still making up for how exhausting and exciting the weekend was, but we are also celebrating the successful completion and 3rd place novice finishing for Team Brozilians, the sale of our home and the quest to find a new one! I can’t believe our June has been so packed with awesome things! 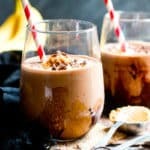 I would love to hear if you make this Protein-Packed Chocolate Peanut Butter Smoothie and any variations you create! 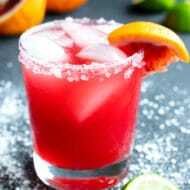 Place all ingredients in a large blender or food processor. Blend until all ingredients are completely smooth. *The amount of honey you prefer can vary. If your protein powder already has sweetener added, use the amount of honey recommended. If your protein powder does not have a sweetener added, use additional honey. **This step is optional. Additional toppings are not calculated into the nutrition facts provided. 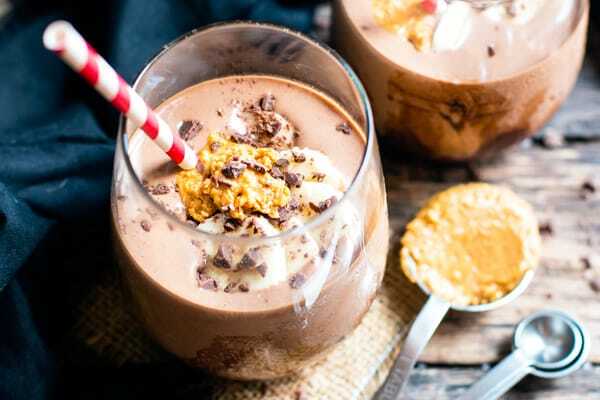 Want more recipes like this Protein-Packed Chocolate Peanut Butter Smoothie?